The New Republic: Defending Obama's Education Plan Seyward Darby of The New Republic explains why charter-school bashing is off-base and why Race to the Top is a cutting-edge effort that encourages states to make big changes that will help all of their students -- black, brown, or white. Students at Harlem Success Academy, an elementary charter school in New York City. 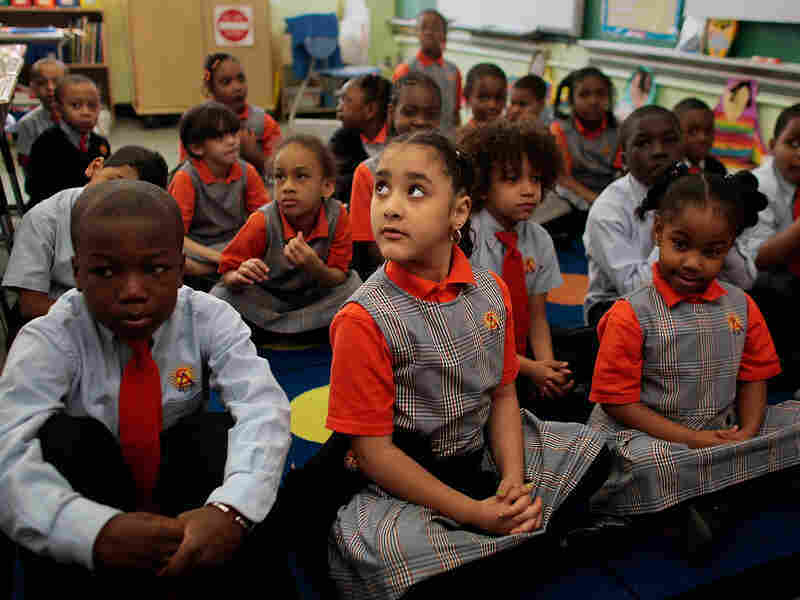 A recent report by Brookings found that Harlem Children's Zone and KIPP schools are outperforming other public schools. When President Obama speaks to the National Urban League today about education reform, he'll be on the defensive. On Monday, the league and six other civil rights groups -- including the NAACP Legal Defense Fund and the Rainbow Push Coalition -- released a document outlining what they see as the most pressing priorities for U.S. public schools. In it, the groups issue strident criticisms of some of Obama's key reform efforts. Their chief complaint? That Obama's could further disadvantage minority students. "[M]ore comprehensive reforms are necessary to build a future where equitable educational opportunity is the rule, not the exception," the document says. There's been some political scrambling since the document came out. Education Week reports that Al Sharpton, who had initially signed on, retracted his support. At a time on Monday initially designated for a press conference to discuss the release, some of the signatories instead met with Secretary Duncan. A follow-up press release noted: "The leaders said the meeting clarified several issues of agreement with the Obama Administration, and broadened understanding among the parties." And then, today, Duncan addressed the National Urban League, promising to form a bipartisan commission to examine education inequities. It seems that, with Obama speaking tomorrow, both sides want to avoid any more controversy. But, politics aside, are the criticisms of the Obama administration fair? I don't think anyone would disagree that minority students, many of whom are also low-income, should receive better educational opportunities. And there are aspects of the document -- about the importance of community engagement, the equitable distribution of resources, the possible problems with the models proposed by the feds to turn around failing schools -- that I either agree with or want to ponder further. But the coalition behind this new reform framework gets some important things wrong about Obama's approach to fixing the nation's schools. Here, I'll focus on two key areas: charter schools and Race to the Top. The framework says that there is "no evidence that charter operators are systematically more effective in creating higher student outcomes nationwide" and that "they are not a universal solution for systemic change." It's true that there is no definitive evidence that charters are better than other public schools. (Studies on this issue have been hotly debated within the last year.) But, as both Duncan and Obama have reiterated many times, they don't support charter schools without reservation -- they support good charter schools. And there are good, even great, ones: A recent report by Brookings about the relative quality of some charters in New York City, for instance, found that Harlem Children's Zone and KIPP schools are outperforming other public schools. Moreover, despite what the framework suggests, Obama, like any reasonably minded education reformer, has never suggested that charters are the answer, or "universal solution," to schools' woes. Rather, they are one tool among many. This is why, for instance, converting a school to a charter is one of four turnaround models the administration has outlined for very low-performing institutions. Interestingly, when the National Council of La Raza was asked why it -- and no other -- national Latino advocacy group signed onto the civil rights framework, the provisions for charter schools were the problem. The document says, "[W]e are concerned about the overrepresentation of charter schools in low-income and predominantly minority communities." Raul Gonzalez, legislative director for La Raza, told the Associated Press: "To suggest that a charter school started by community members who want to help kids in their community cannot serve 100 percent Hispanic kids in a community that's 100 percent Hispanic -- that they should be penalized for that or they shouldn't be allowed to open up -- that doesn't make sense." The framework is especially harsh when discussing Race to the Top and other competitive grant programs, which are central to Obama's education agenda. "If education is a civil right, children in 'winning' states should not be the only ones who have the opportunity to learn in high-quality environments," the document states, noting that 47 percent of the nation's black students live in states that weren't Race to the Top's first-round finalists (meaning, of course, that more than half of lived in states that were). "Such an approach reinstates the antiquated and highly politicized frame for distributing federal support to states that civil rights organizations fought to remove in 1965." The framework goes on to propose replacing competitive grants with "conditional incentive grants," which would be given to all states that "agreed to meet whatever equitable and fair conditions were established." Put simply, this doesn't add up. First, and most basically, consider the numbers. Competitive grants comprise but a fraction of the federal dollars spent on education. Formula-funded efforts still make up 80 percent of the Department of Education's K-12 programs. Meanwhile, Race to the Top, in its first two rounds, is worth $4.35 billion dollars, and proposals in Congress for a third round range from $675 million to $800 million. So the Obama administration hasn't seized funds long-dedicated to poor schools and poured them into competitive grants -- leaving millions of minority students in the dust. Rather, it has carved out a small but significant chunk of money to reward the states with the best, homegrown plans for education reform. As I wrote back when the budget was initially proposed in February, competitive grants are critical because, if the funding status quo were the answer, we wouldn't have the educational disparities and creative stagnation in school policy that we do. For too long, we've allowed states to trudge along, waiting for federal money they know will come, regardless of their will to reform. But Race to the Top, even before winners were selected, spurred important changes nationwide: States lifted charter caps, agreed to adopt common educational standards, and pledged to tie student achievement to teacher evaluations. Indeed, the program has helped create a culture of reform -- a culture the country has long-needed and one that, ideally, will continue to grow and spread. This isn't to say that the program, or any competitive grant initiative, is perfect (see here for a good analysis of why it's a little odd that Ohio is a current Race to the Top finalist). But it's a cutting-edge effort that encourages states to make big changes that will help all of their students -- black, brown, or white. And states should know that big ideas, imbued with initiative and excellence, will be prized.